If we want to preserve our sprawl-preventing Urban Growth Boundary (UGB), then yes, we’ll likely need to increase density. But if we only build housing that a professional class can afford, we will eventually push working class families out of the city center, and the UGB will be busted anyway. We will also be increasing blue collar dependence on motorized vehicles, as they will be forced farther from centrally located jobs to the outskirts of Portland where public transit languishes. That is a situation no urban planner wants to be accountable for. 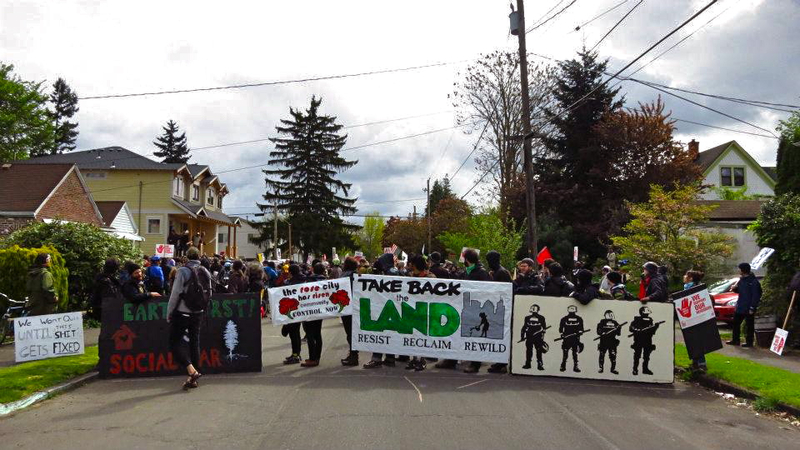 Reclaiming Alicia Jackson’s house, May Day, 2012. These groups have worked hard to keep people in their homes, despite city and county law enforcement, as well as bank-hired armed guards attempting to enforce immoral and often illegal foreclosure notices. The call of ‘Don’t Move Out!’ has been central in the national housing justice movement. 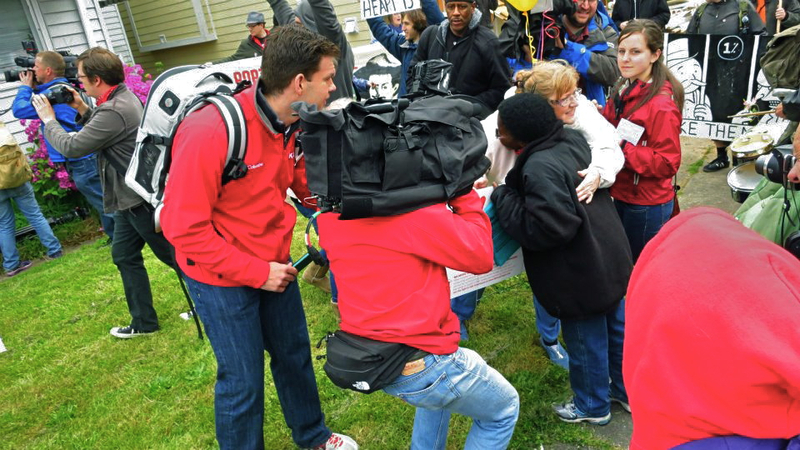 Advocates for resisting forced eviction are essentially telling people to stay put, don’t leave your home, and if you’ve already left, break back in. This is direct action. This is squatting. 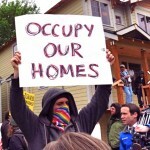 This is a tactic being used to resist a capitalized system of housing across the globe. 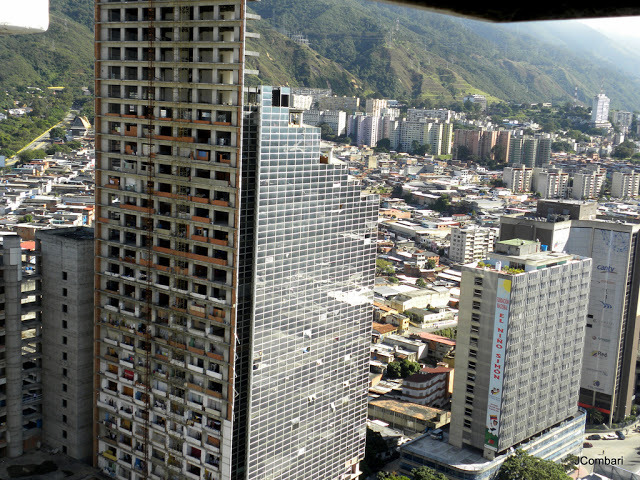 In the heart of downtown Caracas, Venezuela there rises the Centro Financiero Confinanzas, a massive 45 story high-rise tower. Constructed in the mid-90s, the monolithic structure was never finished – a financial collapse ceased the project. Now, the tower is occupied by hundreds of low income families, all living for free. 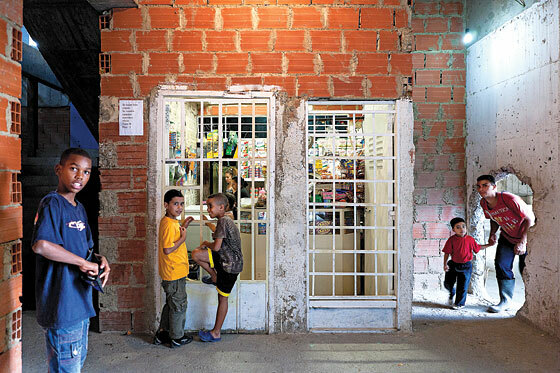 Some 2,500 squatters have created their own ‘urban ecosystem’ that facilitates sanitation, retail, electrical, and recreational needs. They even have their own building security. If you’re of the developer mindset, you’d probably look at this act of adaptive urbanism and complain that such trespass is illegal and deride Centro as a ‘vertical slum‘. However, if you’re the sort who believes housing is a human right, or even more-so that charging rent itself constitutes theft, you’d likely see this form of community based problem solving as a creative victory. Centro Financiero Confinanzas was built to house the very financial industries that profit from exploitation of the planet and the people who inhabit her. The economic collapse that halted its construction would undoubtedly be defined by Charlie Hales as a lack of ‘success’. Hales and other developers fetishize building big and building expensive. The goal is profit, not housing. But when the aims of money-hungry investors reaches too far, markets will collapse. Despite legions of law enforcement tasked with kicking people out of homes occupied unlawfully, there are simply too many humans living without housing to keep them all out. There is growing opposition to the cruelty of this profit-driven housing market. There are twenty-four empty homes for every houseless person in the United States. Communities are organizing, they are fighting back. Does Portland need more ‘density’, more homes for influxes of residents? Certainly. But if Portland continues in the direction of becoming a developer’s utopia, resistance will intensify in response. Whether organized under a banner like HIFE, or whether carried out by entirely autonomous individuals, people are going to assert their human rights to housing, unjust laws be damned. We can, and we must build livable streets alongside homes for the working and underclasses. What is needed are not more condos and luxury apartments. Portland doesn’t need more real estate speculation inflating the cost of housing, it needs community control of urban territory. We can be a city for everyone, but only if we choose to make it so. I think it’s really important for us to ensure that our movements – in particular involving bike lanes and other urban projects – really are about the right to the city and don’t accidentally contribute to capitalists development projects. Right to the City is the key. Community control, not false market-based solutions. Hart will you provide feedback for this doc project?? We need your help. Thoughtful article. We shouldn’t be so quick to kick people out of their homes! So you are saying that we should focus more on local neighborhoods to make their own decisions about their neighborhoods? Should affordable housing be THE priority when it comes to building cities? Let’s say we do focus on building smaller, cheaper units in Portland. Could it be that the demand for housing is so high that the smaller units will be quickly priced out? The demand for affordable housing has far less to do with supply and far more to do with what people can afford. Paying people a living wage would solve this problem overnight. There’s plenty of available housing in this city, the problem nobody making less than $30k a year can afford it.